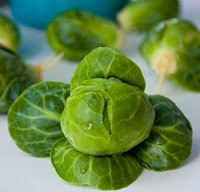 1) Those who liked brussel sprouts as a kid and still do. 2) Those who have had one too many bad brussel sprout encounters and will never be able to enjoy them. 3) Those who have had a few bad brussel sprout experiences and think they do not like them...but when given a deliciously prepared, tender green, braised-caramelized brussel sprout..could learn to uncover their hidden brussel sprout love. Survey Says! My Most Hated Veggie survey showed that there are a lot of 2's and 3's out there. Super Veggie! Everyone should try to love brussel sprouts. They are low in calories and fat-free. They are high in fiber, Vitamin C, Vitamin K and folate. 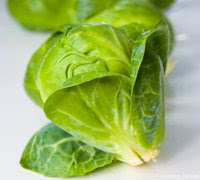 They are also a cruciferous (crew-sif-er-ous) vegetable, which means they are part of the cabbage family. Cruciferous veggies have been linked to lowered cancer risk, oxidative stress and heart-disease rates. Who are you really? FYI, many of the 2's out there may very well be 3's who just don't know it yet! 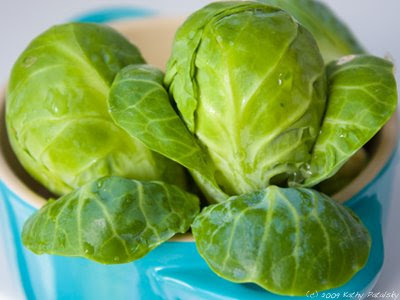 Hopefully, when you read about all the amazing health benefits of brussel sprouts, you will give them a try! Phytochemicals: Indoles and Sulphoraphanes. These phytochemicals may reduce the risk of certain types of cancer. "Oxidative stress in the subjects' bodies dropped 22% during the period when they were eating lots of cruciferous vegetables."